That piece of paper can cause more disruption in your life than you could ever imagine. Couple that with a criminal charge accompanying it, and it can be overwhelming. This could negatively impact your ability to obtain gainful employment, housing, and even loans. It could also prevent you from coaching your son’s little-league team and attending school functions such as dances and field trips. Over the years I’ve seen tremendous amount of lying to gain an advantage whether it’s in a criminal case that deals with assault and battery or the application process and the ultimate testimony involved in obtaining a restraining order but all is not lost. 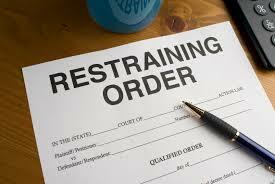 Typically, if a judge grants a temporary restraining order, it will be in effect for 10 days. During that time, you will receive notice to vacate the premises if you share an apartment or house with the person who has filed a restraining order against you. Additionally, you will be required to avoid all contact with the person in question which means avoiding phone calls, e-mails, letters, and any physical contact with him or her. You also cannot have a third party contact that person on your behalf. I refer to these orders as the Hatfield & McCoy’s order. I typically see them in a neighbor scenario where one neighbor decides to cut a tree down and it ends up being on the other neighbor’s property. Loud parties, rights of way, and envy can sometimes end up in court.